WASHINGTON, D.C. -- Small-business owners' optimism about their business situation has edged up in the past quarter to a new 10-year high. 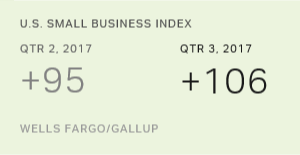 The Wells Fargo/Gallup Small Business Index for the third quarter is at +106, up 11 points since Quarter 2 and the highest since +113 measured in the second quarter of 2007. Index scores between the first and third quarters of 2016 ranged between 64 and 68. These results are based on July 10-14 interviewing with a random sample of small-business owners nationwide. Owners are asked to evaluate both their present business situation and expectations about their business going forward. Small business owners are more positive about the future than about their current circumstances, a pattern that has generally been the case historically. But, the overall increase in the index this quarter is mainly the result of an uptick in present situation ratings, rather than expectations about the future. The present situation score rose from +36 in the second quarter to +45 in the third quarter, while the future expectations score this quarter remained essentially constant -- +61 compared to +59 last quarter. Both of these measures are as high as they have been since 2007. 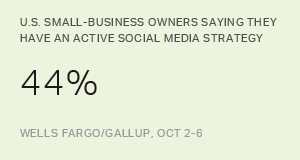 The Wells Fargo/Gallup Small Business Index is based on owners' responses to 12 separate items measuring their financial situation, revenue, cash flow, capital spending, employees and ease of obtaining credit. While the overall index improved 11 points this quarter, it is noteworthy that this uptick was measured essentially across the board, with at least marginal increases on nine of the 12 items. Thus, the increase in optimism appears to reflect general positivity, rather than renewed optimism about one specific aspect of business. Currently, the percentage of small-business owners who say the overall number of jobs at their company increased over the past 12 months is at 21%, not a huge number on an absolute basis, but by two points the highest on this job creation measure since 2007, and just one point below the all-time high of 22%. Meanwhile, 10% of owners say that the number of jobs at their company has decreased over the past year, the lowest since 2006. As has been the case historically, the clear majority of owners over the years report that the number of jobs in their company has stayed the same. When asked to name the top challenge facing their business, small business owners continue to most frequently cite issues relating to government policies -- including regulations and taxes, each mentioned by 9%. This percentage is not markedly changed from the February update on the Small Business Index. Owners in previous research expressed optimism that the new presidential administration would help them address these concerns -- including taxes and the burden of government. So far, the trend data on the open-ended most-important-challenge question do not show an appreciable decrease in those citing government as their greatest challenge. What do you think is the most important challenge facing you as a small-business owner today? In addition to mentioning government policy concerns, small-business owners cite a number of different challenges, including owners who are dealing with economic and financial situations, marketing and attracting new customers, and hiring good employees. 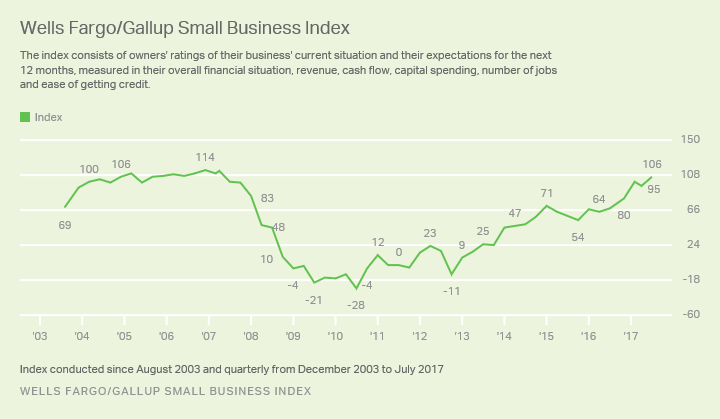 Small-business owners have become increasingly positive about business conditions since the 2016 presidential election, with gains since last year in the Wells Fargo/Gallup Small Business Index, including this quarter's optimism reading of +106, the highest since the second quarter of 2007. Today's relatively strong index value occurs at a time when stock market indexes have reached record highs, unemployment is low, and reports indicate that the demand to buy small businesses is rising. Although President Donald Trump and Congress were unable to pass new legislation dealing with taxes or healthcare at the time of this survey, small-business owners may continue to be sanguine that improvements in these -- and other areas -- will bode well for their future. Be exceptional. Attract, hire and retain top performers. Results are based on telephone interviews with 605 U.S. small-business owners in all 50 states, conducted July 10-14, 2017. The margin of sampling error is ±4 percentage points at the 95% confidence level. For more information about Wells Fargo Works for Small Business, visit http://wellsfargoworks.com/. Follow us on Twitter @WellsFargoWorks. Learn more about how the Wells Fargo/Gallup Small Business Index works. About six in 10 Americans see themselves as upper-middle or middle class, with most of the rest identifying as working or lower class. Middle-class identification has returned to pre-recession levels. 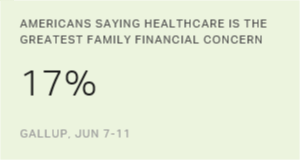 Americans name healthcare as the top financial problem facing their family, while concerns about low wages have fallen to pre-recession levels. Americans believe immigrants help the economy by providing low-cost labor rather than hurt the economy by driving down wages in the U.S.
A substantial percentage of small businesses in the U.S. report having no active social media strategy or use of e-commerce for customer interactions.